Like other raptors, the Bald Eagle is an important part of the natural environment. It preys on older and weaker animals and maintains wild populations of waterfowl, fish, small mammals, rodents and wading birds. They also help the environment by eating carrion (dead animals). 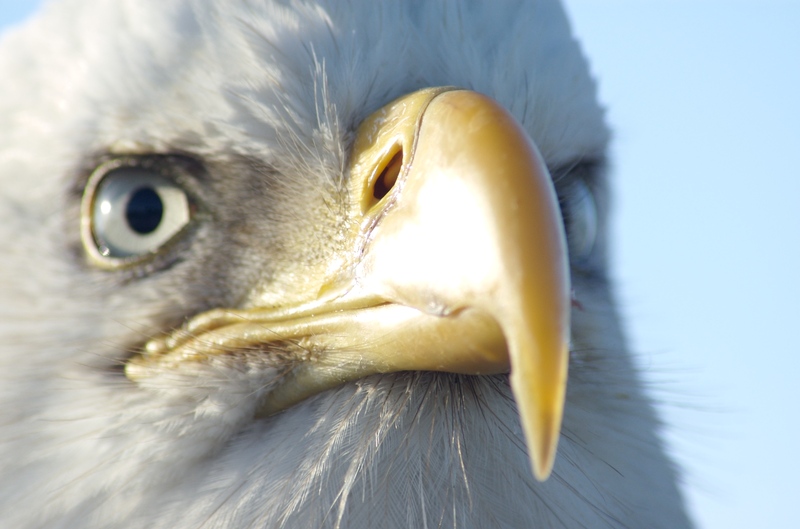 Despite its name, the Bald Eagle is not bald. It has white feathers on its head. The word ‘balde’ in Old English meant white, and that is where it got its name. This bird of prey is unique in that it can actually swim using movements similar to the butterfly stroke. Its wings are not just useful for swimming, either. 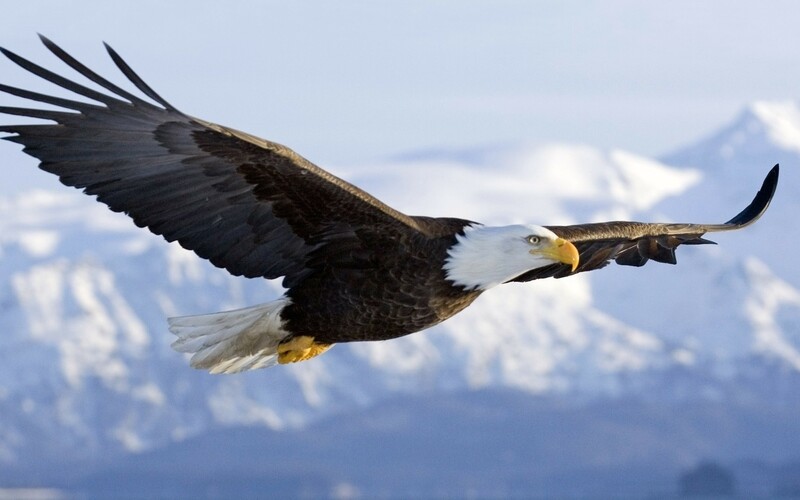 Bald Eagles generally fly somewhere between 20 and 40 miles per hour and can dive at speeds of up to 100 miles per hour. This raptor is also notorious for using the same nest over and over again, adding new material to it each breeding season. One nest found weighed over two tons and had been used for 34 years. 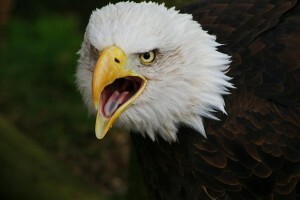 Adult Bald Eagles are very distinctive with their white head and dark brown bodies. The young are less distinctive with white blotches on their bodies, which they lose at age four or five. Their beaks are large, yellow and curve down. 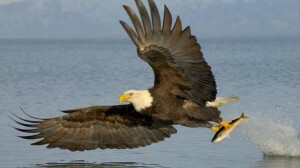 Bald Eagles are large with males weighing around nine pounds and females weighing around twelve pounds. They stand approximately three feet tall upon attaining full maturity. 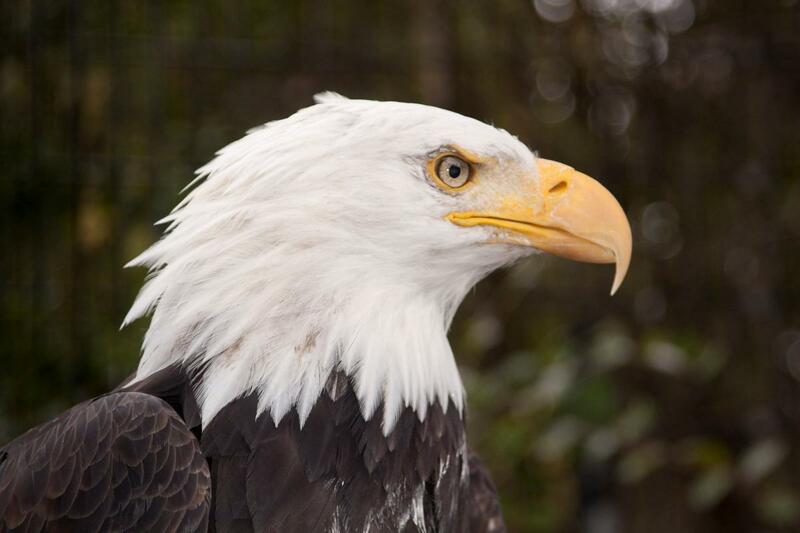 The Bald Eagle is the only eagle found exclusively on the North American continent. They are found as far north as Alaska and northern Canada and as far south as northern Mexico. 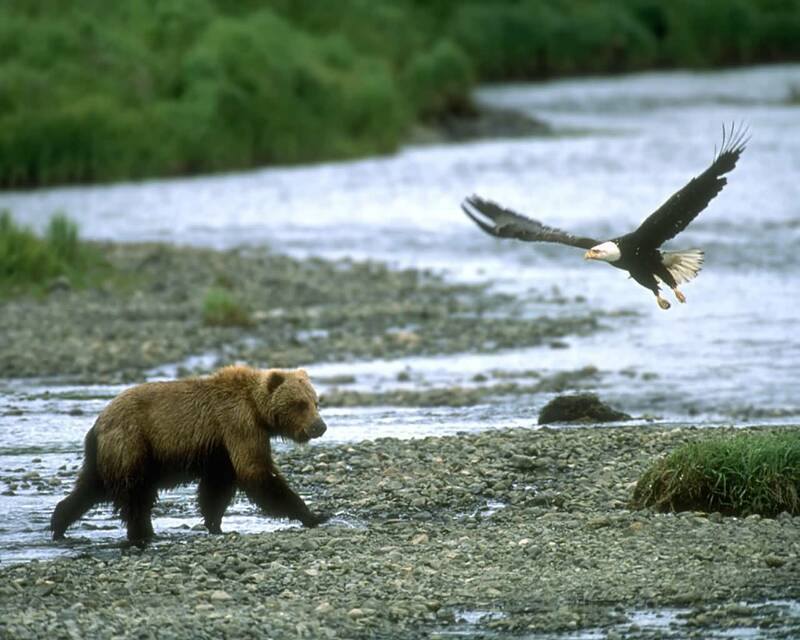 80% of the Bald Eagles in the United States are found in Alaska. One of the few eagle species that migrates, they tend to follow their food supplies and stay near open fresh water or coastlines. Their habitat includes wet prairie areas, fresh water areas and coastal areas, especially those near pine forests. 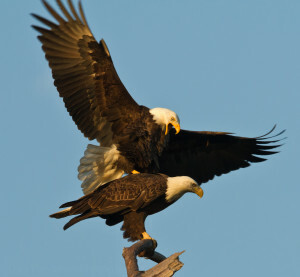 Bald eagles become ready to mate between the ages of four and five. Breeding season begins in the winter in the south and makes a steady progression of time and latitude until the eagles in the far north begin in the spring. Nest sites are very important, as eagles will only choose areas near water with extremely tall trees and a good view of the area. Sometimes they will roost with many birds, but usually they nest alone. Eggs are laid approximately one month after mating and incubation takes between one month and six weeks. Between one and three eggs are laid and if the clutch fails, another may be produced. The young begin to fly around two or three months but may stay with their parents for another four to six weeks.